Hey guys, my name is Justin. 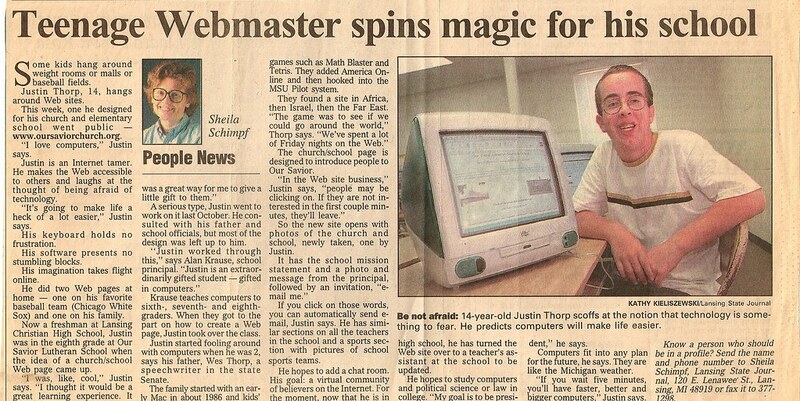 I started seriously making websites in 1998, when I was 13 years old. Now, I’m the Marketing Manager for DC-based online financial guidance startup HelloWallet. Previously I was the Director of Publisher Happiness for the world’s largest social sharing and targeting company AddThis (was called Clearspring then). In this role, I lead customer relations, product evangelism and marketing strategy using traditional methods as well a variety of new media channels. During my time at Clearspring, I saw our user community grow to reach over 1.2 billion unique visitors, 11 million websites (ranging from The White House to Budweiser) and sharing capabilities to over 300 online services (including everything from Twitter to Netherland-based Hyves). While at AddThis/Clearspring, in 2009, I had the honor of being named as one of the 100 Tech Titans in Washington DC by Washingtonian Magazine. Before joining Clearspring, I helped advise the Library of Congress on the future of its Web strategy along with some Web development, through the government contractor CACI. During my tenure, we saw the Library of Congress launch it’s blogging strategy, launch a content distribution program with One Laptop Per Child, launch of the Library’s partnership with Flickr to launch the Flickr Commons Project, research into mobile content deliver for developing countries, and much more. Prior to being in Washington DC, I got my undergraduate degree at the Rochester Institute of Technology. There I got my Bachelor of Science in Information Technology with a minor in Political Science. During college, I also worked at Michigan State University as web developer for the lead university web team. I helped with the 2006 redesign of the home page (www.msu.edu), helped lead MSU’s efforts for Web Accessbility, and countless other projects. Hey Justin I didn’t realize you started a new blog site. Then I’m looking around here and I didn’t realize you had so many different web pages. I’m keeping you in my prayers and I hope we will get to see each other soon. There are a ton of people here in Rochester who miss ya. Interestd in how to cation videos from a webcam. Trying to organize a group that makes videos (fellowship) Deaf-friendly. I have many friends whom are HH a/o Deaf and am discouraged that resources are not accessible to them which is awful. I’m thinking of going back to school and learning to become a captioner. Until then, how can we make our materials/resources Deaf-friendly? Rene, there is a company called PlyMedia that can do this well, but I think it might be aimed at enterprises. Have a great time in SanFran.